There are several ridiculous events on Facebook that show we're clearly not letting Hurricane Florence walk all over us! GREENSBORO, N.C. (WFMY) – When Mother Nature throws shade towards the southeast, we like to throw shade right back. An event posted on Facebook shows thousands of people are going to or are at least “interested” in shouting “Fake News” at Hurricane Florence to make her go away. Another event, started by students at Wake Forest University suggests pointing at Hurricane Florence and sternly telling it to go away. More than 30,0000 people are interested in that one. We’re pretty sure that’s not how weather works, but you know, it may be worth a try? There are so many suggestions, we can hardly keep up. One suggests shooting into the hurricane (DISCLAIMER: don't do this), while another suggests sacrificing Nick Saban, the head football coach of University of Alabama, to the weather gods (DISCLAIMER: Definitely don't do this!). Still more are considering lawsuits against the force of nature, while others are considering a good old fashioned Care Bear Stare to fight a hurricane. A jokester posted on Facebook that Nickelback is performing in the Eye of Hurricane Florence, for fans of the band that police in a Canadian town used to play in their cruisers to punish suspected criminals. 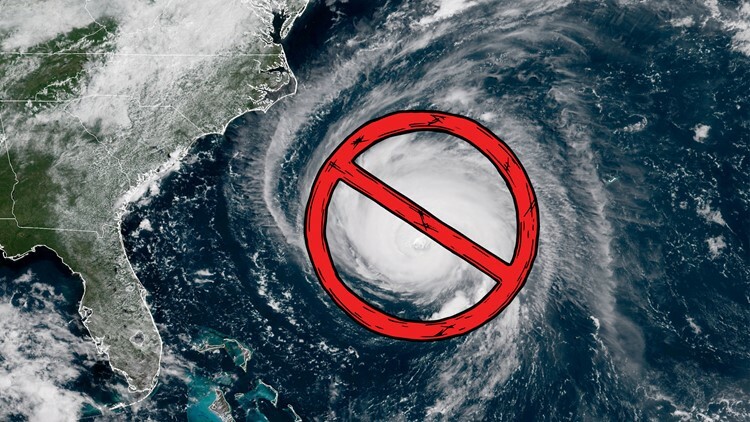 Others are considering blowing their saxophones at Hurricane Florence to make it go away. Our personal favorite suggests playing a "reverse card" from Uno so it goes away and "doesn't heck up the East Coast."